The Global Volcanism Program has no activity reports for Edziza. The Global Volcanism Program has no Weekly Reports available for Edziza. The Global Volcanism Program has no Bulletin Reports available for Edziza. The composite felsic stratovolcano Mount Edziza and associated satellitic lava domes and pyroclastic cones were constructed over the past 7.5 million years during five magmatic cycles beginning with eruption of alkali basalts and ending with felsic and basaltic eruptions as late about 1000 years ago. The 7.5 million-year-old (Ma) Armadillo Peak stratovolcano at the south end of the complex is overlapped by the Ice Peak central volcano, which was formed during the early Pleistocene, and contains a caldera largely destroyed by glaciers. The Mount Edziza stratovolcano on the north was formed about 1.0-0.9 Ma. A 2-km-wide, ice-filled caldera truncates its summit; lava domes were subsequently emplaced around its periphery and lava lakes ponded within the caldera and overflowed its rim. Numerous ice-contact features and products of subglacial eruptions are found in the Mount Edziza complex. More than 30 Holocene pyroclastic cones, primarily of basaltic composition, are located on Mount Edziza and the adjacent Spectrum Range, some of which are younger than about 1300 years before present. 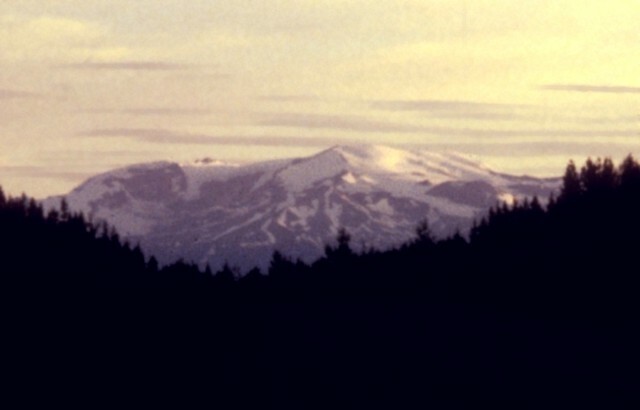 Large areas of Holocene lava flows of the postglacial Big Raven Formation are located north of Mount Edziza, forming the Desolation Lava Field, and south and SW of Ice Peak, forming the Snowshoe Lava Field. Souther J G, 1967. Cordilleran volcanic project. Geol Surv Can Pap, 68-1A: 42-43. Souther J G, 1970. Volcanism and its relationship to recent crustal movements in the Canadian Cordillera. Can J Earth Sci, 7: 553-568. Souther J G, 1992. The late Cenozoic Mount Edziza volcanic complex, British Columbia. Geol Surv Can Mem, 420: 1-320. Souther J G, Symons D T A, 1974. Stratigraphy and paleomagnetism of Mount Edziza volcanic complex, northwestern British Columbia. Geol Surv Can Pap, 73-32: 1-48. 6520 BCE ± 200 years Unknown Confirmed Radiocarbon (uncorrected) North flank? There is no Deformation History data available for Edziza. There is no Emissions History data available for Edziza. The Mount Edziza complex, seen here from the east along the Cassiar-Stewart Highway, is part of a large volcanic plateau that is the centerpiece of Mount Ediziza Provincial Park, one of the largest in British Columbia. The complex was constructed over the past 7.5 million years during five magmatic cycles beginning with eruption of alkali basalts and ending with felsic and basaltic eruptions as late about 1000 years ago. Numerous ice-contact features and products of subglacial eruptions are found in the Mount Edziza complex. Photo by Ben Edwards, 1995 (Dickinson College, Pennsylvania). The central ice-covered summit complex of Mount Edziza is seen here from the SW rising above the Kitsu and Big Raven plateaus. Late-Tertiary lava flows form the foreground. 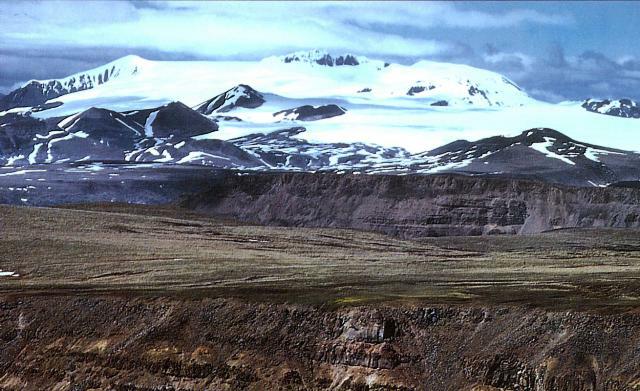 The low conical hills at the base of the icecap are Quaternary volcanic cones. Mount Edziza contains a 2-km-wide, ice-filled caldera that truncates its summit, and numerous ice-contact features and products of subglacial eruptions are found. The complex contains numerous Holocene pyroclastic cones, some of which are younger than about 1300 years. Photo by Jack Souther, 1992 (Geological Survey of Canada). 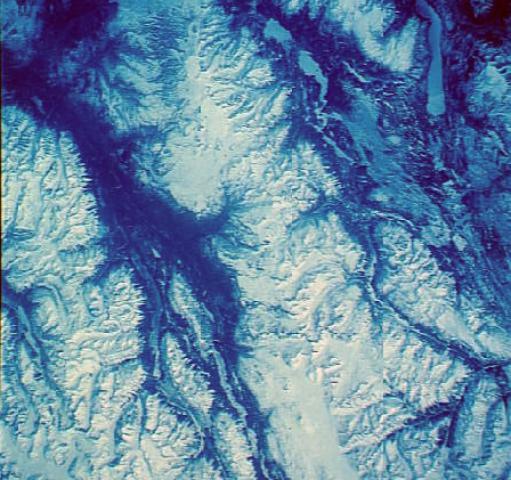 The snow-covered mountains at the right-center, lying between the Mess Creek (left) and Little Iskut River (right) drainages, are in the Spectrum Range, one of four large composite volcanoes making up the Mount Edziza-Spectrum Range volcanic complex. Holocene pyroclastic cones and lava flows are found on the NW and SW sides of the Spectrum Range. The Mount Edziza complex appears at the top of this image (with north to the upper left), west of snow-covered Nuttlude and Kakiddi lakes. Elongated Kinaskan Lake is at the upper right. NASA Space Shuttle image STS039-90-110, 1991 (http://eol.jsc.nasa.gov/). 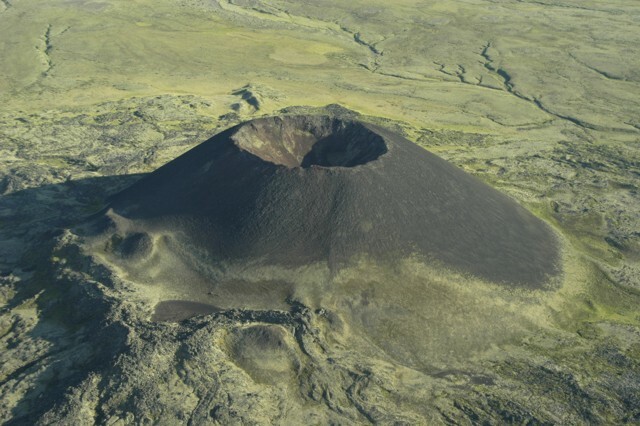 Cinder cones, such as Eve Cone on the flanks of Edziza volcano, are formed by the explosive ejection of fragmental material, which accumulates around the vent. This symmetrical cone is part of the Desolation Lava Field on the northern flank of Edziza and is one of the youngest features of the volcano. Basaltic lava flows issued from the base of the cone, which rises about 150 m and has a symmetrical, 45-m-deep crater. There are no samples for Edziza in the Smithsonian's NMNH Department of Mineral Sciences Rock and Ore collection. IRIS seismic stations/networks Incorporated Research Institutions for Seismology (IRIS) Data Services map showing the location of seismic stations from all available networks (permanent or temporary) within a radius of 0.18° (about 20 km at mid-latitudes) from the given location of Edziza. Users can customize a variety of filters and options in the left panel. Note that if there are no stations are known the map will default to show the entire world with a "No data matched request" error notice. Large Eruptions of Edziza Information about large Quaternary eruptions (VEI >= 4) is cataloged in the Large Magnitude Explosive Volcanic Eruptions (LaMEVE) database of the Volcano Global Risk Identification and Analysis Project (VOGRIPA).